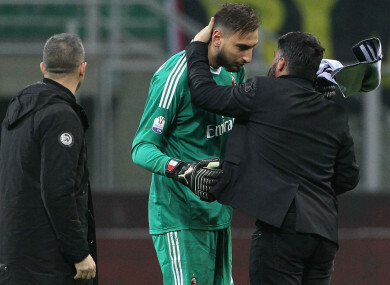 AC MILAN HEAD coach Gennaro Gattuso rushed to the defence of goalkeeper Gianluigi Donnarumma after the teenage goalkeeper received abuse from the club’s ultras in the 3-0 Coppa Italia victory over Verona. Donnarumma put in a typically assured display at San Siro on Wednesday as goals from Suso, Alessio Romagnoli and Patrick Cutrone set-up a quarter-final derby against Inter. However, the 18-year-old was in tears prior to kick-off and had to be consoled by Milan captain Leonardo Bonucci after Milan’s ultras brandished a banner stating: “Our patience is finished” following reports that Donnarumma’s agent Mino Raiola may seek to get the goalkeeper’s latest contract extension cancelled. The Italy international has proved a controversial figure at Milan following a prolonged contract saga in the off-season, but despite this latest development, Gattuso was swift to defend Donnarumma. “He’s an 18-year-old kid, of course he was shaken,” Gattuso told Rai Sport. “I can only thank him for what he’s doing. For his age, he’s the best goalkeeper in the world right now. “You can tell from his face he’s not happy, but I have known a great athlete and great kid. He will have my protection, for all the protection I can give. “If the club says it doesn’t need to sell anyone, nor wants to, then why should we even talk about this? I respect the fans, but people need to understand whether Gigio really does want to go or if he wants to stay. I can say I’m working with a great athlete and professional. “I am the coach of Milan, so I can talk about the lad, the athlete, but nothing else. Gigio has not told me personally that he wants to leave. If he did, that would be different. “I’m not talking about Mino Raiola, because I speak to Gigio every day. I don’t know if Mino is trying to push players away from the club either. Despite the abuse aimed at Donnarumma, Milan put in a confident display – Giacomo Bonaventura integral as the hosts went 2-0 up inside half-an-hour. Cutrone wrapped up the win in the second half, Lucas Biglia then striking the woodwork late on – and Gattuso can now look forward to a Milan derby on 27 December. “Now we must concentrate on the important games we’ve got, when the derby arrives, we’ll prepare for that,” he continued. “We have to improve. The performances are better, but not exceptional. Email “AC Milan's 18-year-old goalkeeper reduced to tears following abuse from club's ultras ”. Feedback on “AC Milan's 18-year-old goalkeeper reduced to tears following abuse from club's ultras ”.